Ah the marvels of chocolate cake! 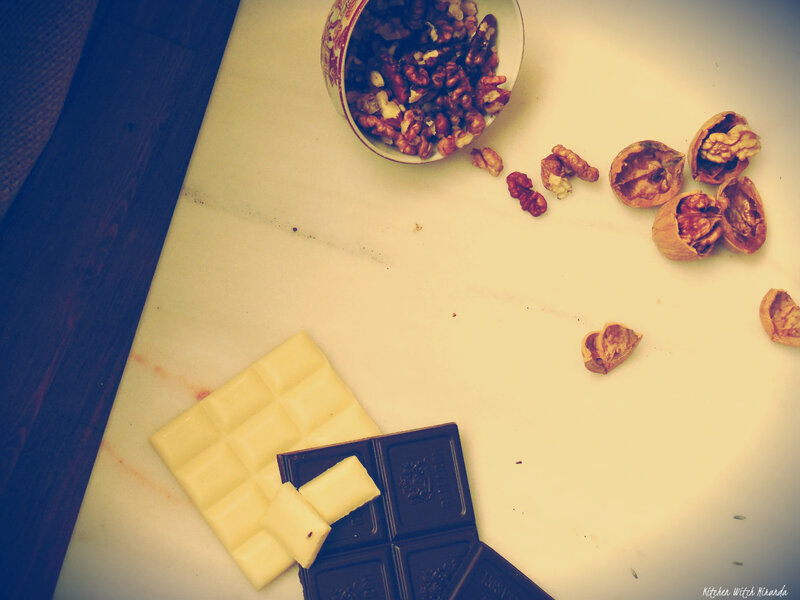 I am a chocolate lover, there's no denying it, even though I am slightly allergic to it. Anything made of or with chocolate, I'm in. And so I am always on the quest for the perfect chocolate cake, the perfect chocolate filling, the perfect chocolate topping. 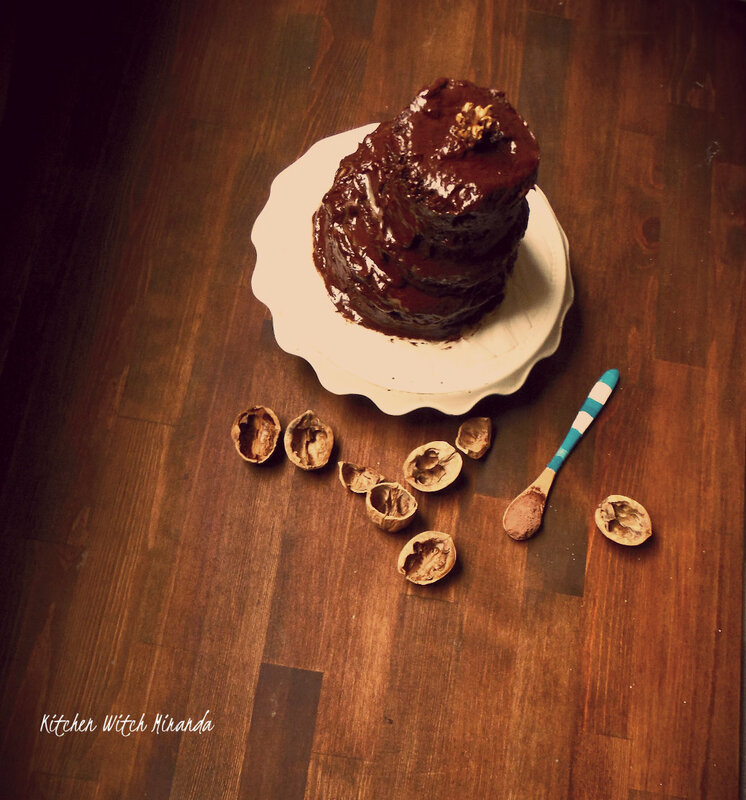 I particularly love the combination of walnuts and chocolate, the way they complement each other is like a symphony of flavours that bursts in your mouth, making tastebuds sing. 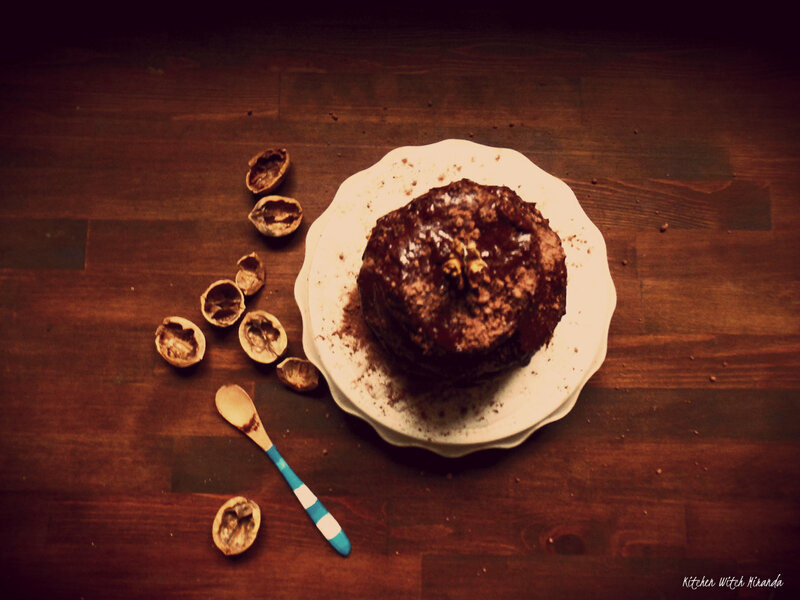 Walnuts' creaminess, their buttery sweetness, contrasts handsomely with dark chocolate's tangy bitterness, and melts perfectly with white chocolate's fudgy taste. 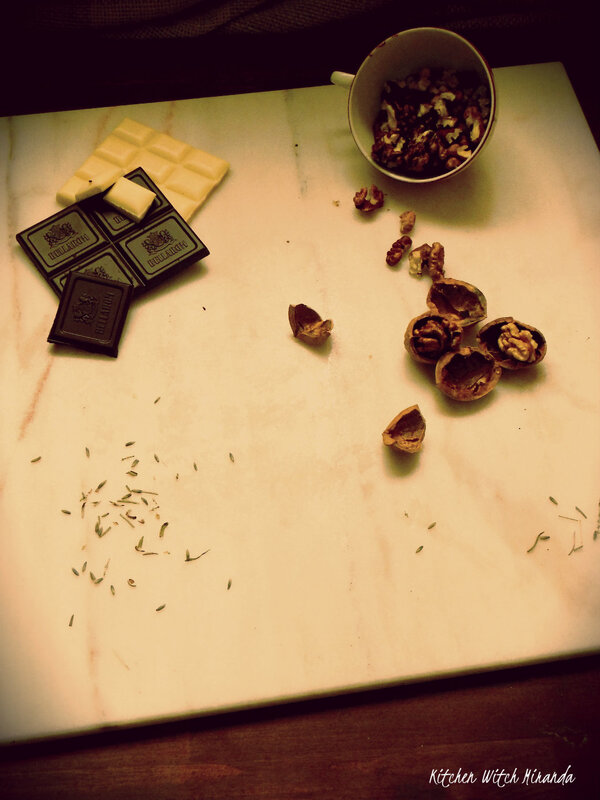 So, it is no wonder I would pair bitter black chocolate, sweet white chocolate and buttery walnuts in a cake. 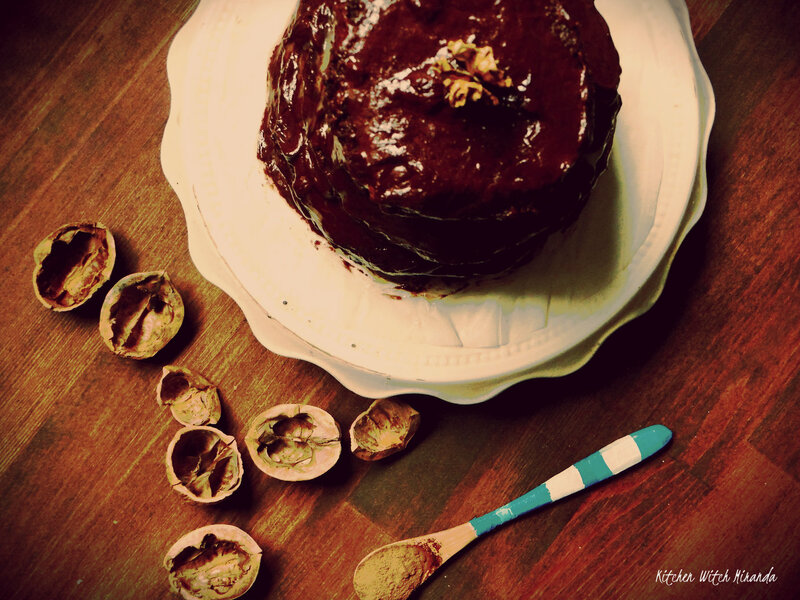 The batter is a simple sponge, with cocoa powder for taste and colour, the glaze is a dark chocolate ganache, the filling is a white chocolate meltdown, and the walnuts are scattered inside. It is like an opera to the senses, this three tiered cake, a heavy. luscious indulgence, meant for special days alone, although I am rather particular to having a slice of chocolate cake for breakfast on a week day, mainly on a monday. You'll start off your week a whole lot better, trust me. So how do you go about it? You'll need a dark chocolate tablet, one that is at least 70% cocoa - I do like it very bitter! You also need a white chocolate tablet. 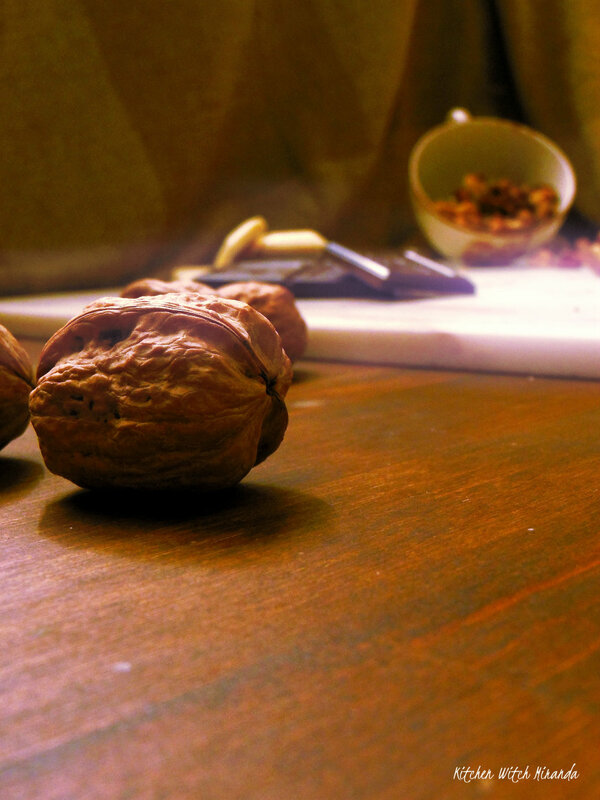 A cup full of walnuts. Some butter, some cream. All this for the filling and the ganache. Take a small pan and fill the bottom with water, one finger high. Place it over heat and let it come to a simmer. Cover with a heatproof bowl, and scatter the chocolate, broken into large chunks inside it. When it starts melting, add the cream and the butter, and you can also add some sugar if you're not very fond of bitter chocolate, mix well with a wooden spoon, and once it's melted and well mixed, take it off the heat and set aside. Here you will use the same method, the bain marie. PLace your pan with a finger's height of water over heat, let it come t a simmer, place a heatproof bowl over the pan, with the chocolate cut into large chunks inside, add the butter and let it melt through mixing well together. As soon as it has melted, get it off the heat and reserve. 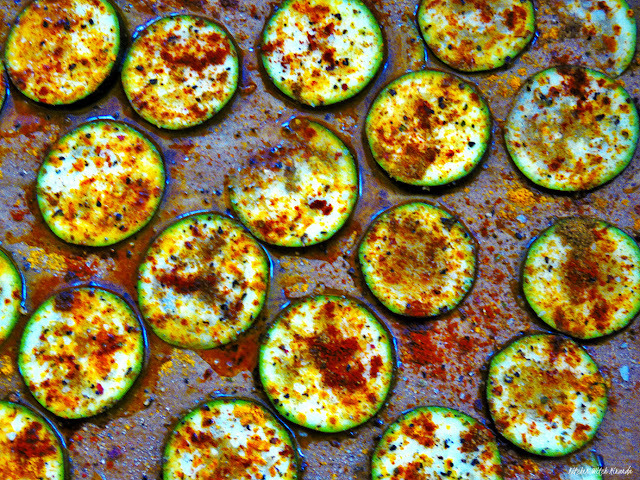 Heat the oven to 180º. Line a baking tin, like the ones you would use for roasts, with parchement paper. Cream the butter and the sugar thoroughly, until they're pale, and beat in the eggs. Add the cocoa powder and mix well. Then gently fold in the flour and the baking powder, combining well together and adding the walnuts. The batter should be of a dropping consistency, if you find that it's too runny add a litlle more flour, if it's too thick, a splash of milk should do the trick. If you have those round cutters for assembling dishes or cutting dough, line three of them, of different circumferences, of course, because you want to stack them. If you don't, just pour the batter into the baking tin and after it's cooked and settled and cooled enough, just cut it into the shapes yu want, doesn't have to be a round three tiered cake, you can make a double layered square or round. Bake for 20-25 minutes, and check with a skewer to see if it's cooked through, and allow it to cool over a rack for at least ten minutes. 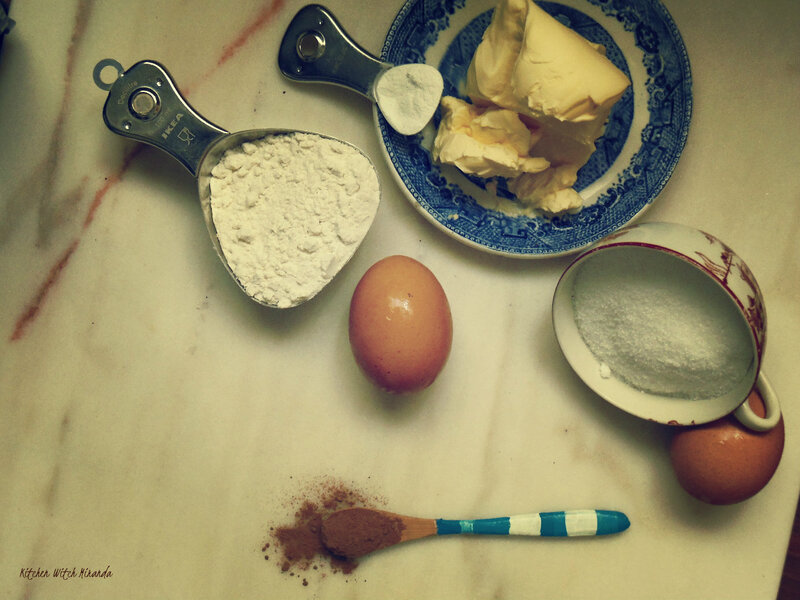 To assemble the cake, place the largest layer on a plate and slather it with the white chocolate mix. Place the second largest layer over it and repeat the slathering. Finally, add the last, and smallest, layer, and cover the whole cake with the dark chocolate ganache. 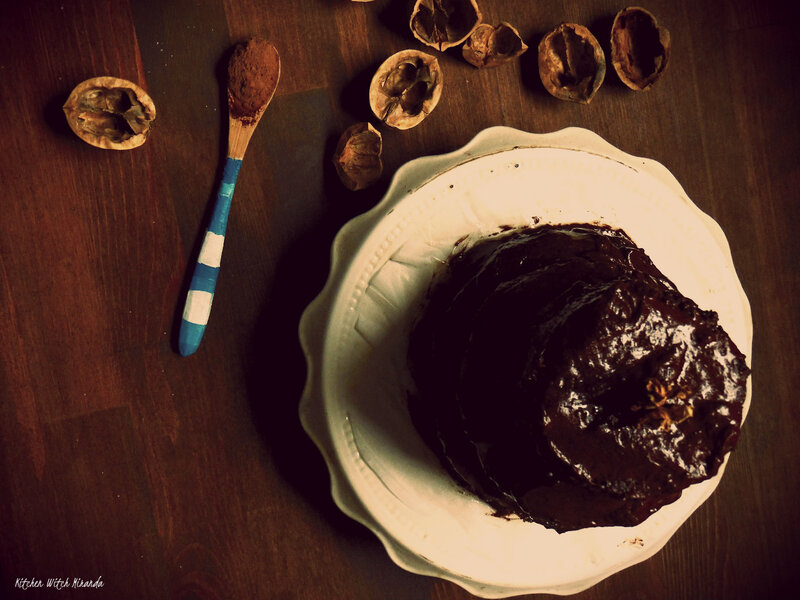 Drizzle some cocoa powder over it and add a walnut to the top, for decoration. 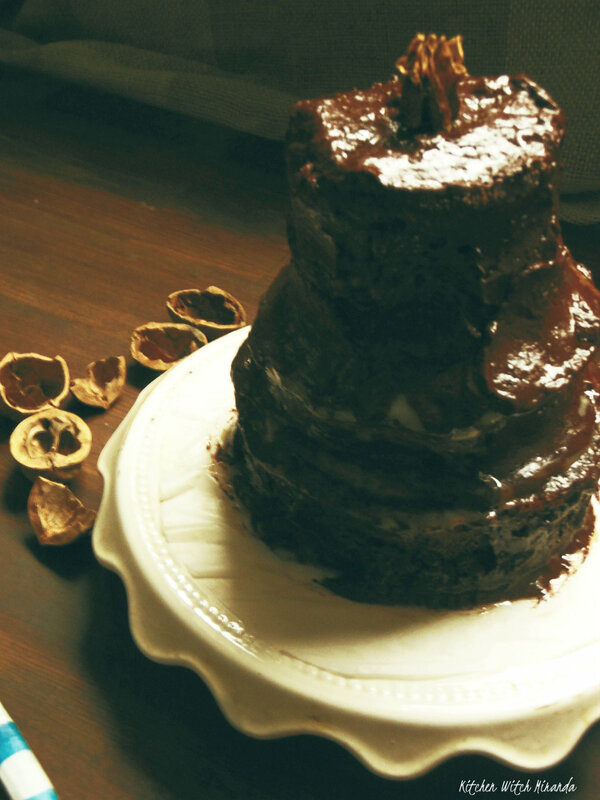 Et voila, there's your layered and tiered two chocolate and walnut délice!! Hope you enjoy it over a tall glass of milk or a cup of tea. eh lá, isso é mau, adoooro nozes, iria sofrer!! ai meu deus, que bom aspecto! 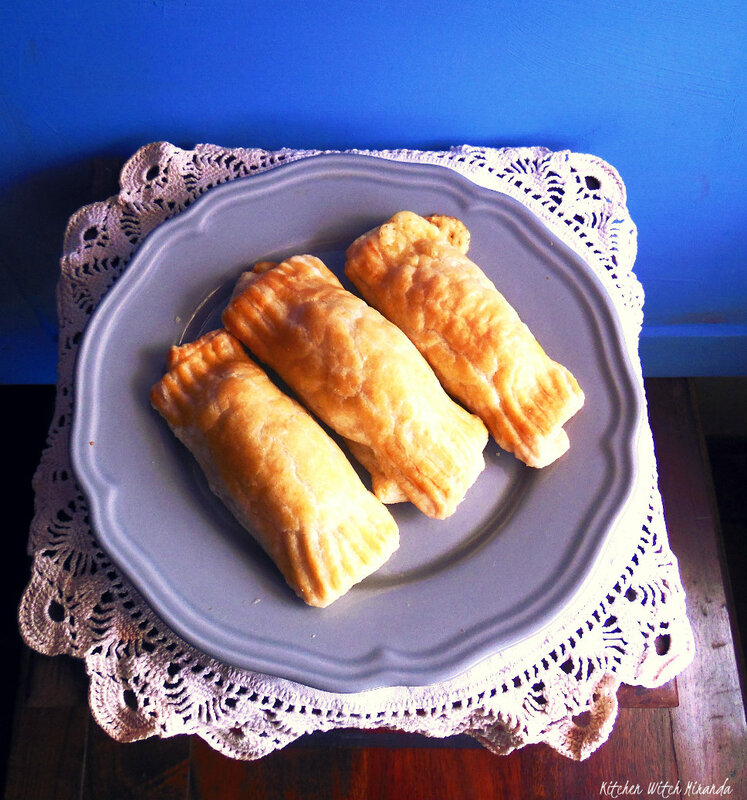 és tão talentosa , na cozinha, na escrita... enfim! só que não eheheheh, sou apenas normal. sinceramente podia ter ficado melhor, confesso. com esta chuva e frio que se faz sentir hoje todo o dia, havia lá nada melhor que uma fatiorra [sim, bem generosa] desse teu bolo lindo e tão apetecível!! !